The Vancouver Giants (35-13-2-1) improved to 7-1 on the season against the Prince George Cougars (16-30-4-2) thanks to some overtime heroics (again) from Bowen Byram. 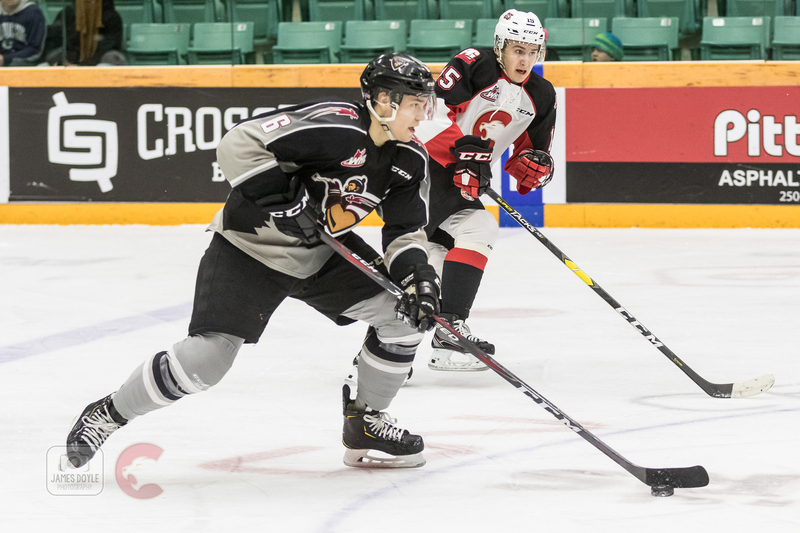 The 2019 NHL Draft prospect netted his league-leading third overtime winning goal (all of which have come in a span of 11 games) 57 seconds into overtime, propelling the Giants to a 4-3 victory over the Prince George Cougars. Jared Dmytriw, Brayden Watts and Aidan Barfoot added goals in the second period while goaltender David Tendeck stopped 28 of the 31 shots fired his way. Vladislav Mikhalchuk, Josh Maser and Reid Perepeluk responded with goals for the Cougars who erased a 3-0 deficit to force overtime. Taylor Gauthier made 26 saves on 30 shots faced in the Prince George net. VAN – Jared Dmytriw (11) opened the scoring at 7:11 of the middle-frame. He stole the puck at the Cougar blueline, raced wide on the defender and then tucked a backhand shot past Taylor Gauthier. VAN – A minute and 23 seconds later Brayden Watts (12) converted off a tic-tac-toe passing play off the rush with Bowen Byram and Justin Sourdif. VAN – Aidan Barfoot (3) increased the Giants lead to 3-0 at 12:55 when he lifed a backhand shot past the glove of Taylor Gauthier and home. Lukas Svejkovsky and Justin Sourdif added the helpers. PG – Vladislav Mikhalchuk kick-started the Cougars comeback bid at 16:00 of the middle period when he banged home a Cole Moberg rebound on a power play. PG – Josh Maser moved Prince George back within a goal at 19:50 when he converted off his own rebound in close. PG – Reid Perepeluk (1) netted his first of the year at 11:05 of the third period off a miscue in front of the Giants net to even the score at 3-3. VAN – 57 seconds into overtime, Bowen Byram (21) ended the game off a two-on-one rush with Dylan Plouffe. Byram raced down the right-wing, cut to the middle and snapped a shot past Gauthier to solidfy the Giants 35th victory of the season. Next Giants Game: Friday night in Kamloops against the Blazers at 7:00 PM. Through 16 games in 2019, Bowen Byram has scored 12 goals along with 10 assists for 22 points. In eight games this season against Prince George, Byram leads all Giants with three goals and five assists for eight points. David Tendeck improved his record to 3-1 on the season against the Cougars with a 1.25 goals-against-average and a .958 save percentage. Over the course of the past three games, rookie Justin Sourdif has scored twice while adding two assists for four points. He leads all Giants rookies with 14 goals and 12 assists for 26 points. He also leads all Giants forwards in plus-minus with a +15 rating. The Giants improved their road record to 15-8-1-0. The Giants will head into Friday’s game with Kamloops trailing the first placed Everett Silvertips by three points for the Western Conference lead.